Russian apple cake that's sure to please. Grease cake pan with oil, flour. Pre-heat oven to 350 °F (175 °C). Beat eggs with sugar in a bowl. Stir in flour. Beat till smooth. Will be thick. Core, quarter and slice apples thinly. Layer half of apples on bottom of pan. Pour 1/2 of batter over. Layer other half of apples, pour remaining batter over. Spread smooth. Allow to cook before cutting or removing from pan. Serve warm or at room temperature. Great recipe! So easy and fast to make and everyone in my family enjoyed it. This really sounds good!!! The calories are acceptable and the fat amount is fabulous. I will comment after making. Thanks rkd314. So many desserts are waaaayyy to high in calories and fat. This one is perfect. Hope it tastes perfect too. 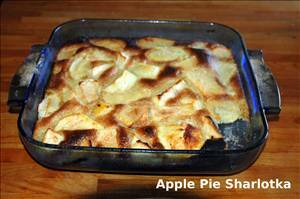 There are 204 calories in 1 serving of Apple Pie Sharlotka. Calorie break-down: 10% fat, 82% carbs, 8% protein.